The Last Supper, Leonardo da Vinci ca. 1498. 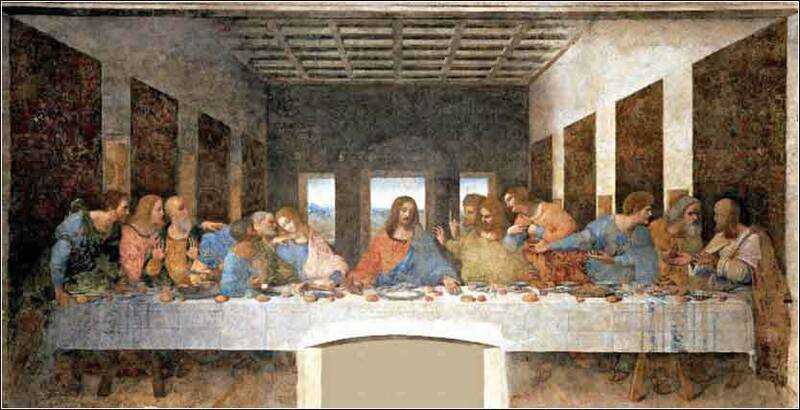 One of the most famous paintings in the world, the sheer size of Da Vinci’s Last Supper shocks most people who see it in person for the first time; it is about 30 feet wide and 15 feet high. The lovely voice of soprano Sandrine Piau gives a quiet and lovely moment of praise to the glory of God. Tithe in Kind by Edward Robert Hughes, ca. 1895. 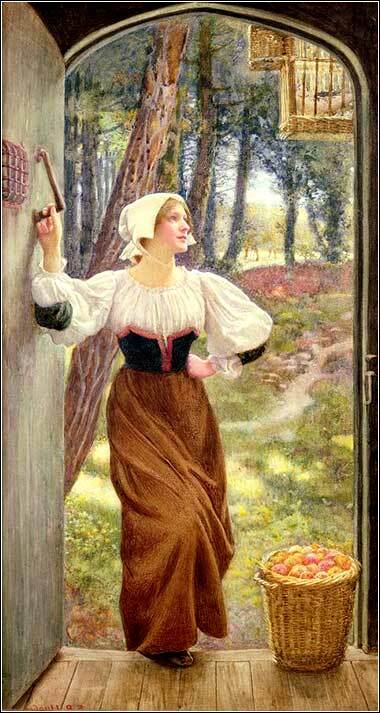 This unabashed sentimentalist portrait shows a young woman bringing the first fruits of her apple orchard as an offering to a parsonage. because they give bread to the poor. Although we have gone over this several times, it might bear repeating here: In a nutshell, as Christians, we are not obligated to follow the letter of the law; but we are obligated to discern the spirit of the law and follow it. (In many cases, this makes the law much more demanding — e.g. Matthew 5. To divide the laws of Exodus 34 into ten "commandments" — the Hebrew word used to describe them is actually "ten words" or "ten matters" — the most logical scheme (or at least, one logical scheme) is to separate these three as commandments 8, 9 and 10. These look very odd to us, accustomed as we are to hearing "thou shalt not steal". But just because they are difficult for us to understand and apply to our modern lives does not make them less important. If you think of the crucifixion, you will remember that Christ's body was not allowed to hang on the cross. He was the ultimate Passover sacrifice and was, in accordance with the first of the laws stated in today's Scripture, consumed (by being put into a sealed tomb) at sundown on Passover. In our worship today, we must not become sloppy or casual about our modern-day symbolic ritual sacrifice, holy communion. Those wafers most people eat with their wine or grape juice are unleavened for a very specific reason: we remember, and keep holy, God's commandments concerning Passover. There really is no reason not to. We celebrate God's creation of a saving relationship with humanity in the very specific way prescribed by God Himself. In fact, many churches will take pains that the "blood of my sacrifice" — the wine or grape juice consecrated or designated for communion — is consumed in its entirety before the service is over. In, say, a Lutheran church, you might notice that the celebrant of a communion service will drain the cup at the end of communion and then cleanse it. If you ever wondered why: now you know! But more generally, holy communion is a solemn event, no matter what church we might attend. We must never just go through the motions. We must remember and reflect on the Last Supper and the crucifixion whenever we do it, for that is its purpose. It is like an alarm clock, telling us "remember the sacrifice now". It is a discipline to make sure that we reflect upon Christ's sacrifice on a regular basis. And we cannot think that Hebrew sacrificial practices are so utterly foreign to us; reflect upon what it means, that we actually eat and drink, in church, in the heart of our worship service. The second of today's law, the First Fruits Commandment, is much easier to translate into modern practice: When we pay the bills, we must pay God first. Our sacrifice or offering to God is our number one priority. It is the first check (or checks) we write, literally, when we get our paycheck. Psalm 33:11 (NKJV): The counsel of the Lord stands forever, the plans of His heart to all generations.